Sarah Fisher is a TTouch Practitioner based in the U.K. and is a regular contributor to many of the UK’s top animal magazines. She travels widely in the UK giving presentations and teaching workshops to staff at the UK’s leading animal shelters including Battersea Dogs Home, The Mayhew Animal Home and the National Canine Defence League. 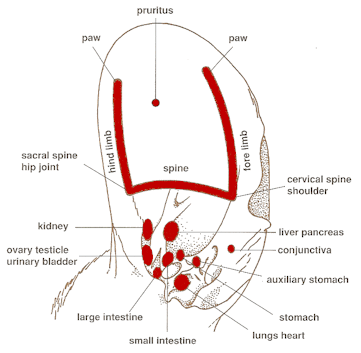 Tension Patterns are areas of tightness that exist in an animal’s body. They may be obvious and inhibit the natural movement of an animal to a greater or lesser degree or may be subtle and less easily detected. Either way they will have an effect on the way the animal functions on an emotional, mental and physical level. They can influence not only how the dog thinks, feels and learns but can hamper a dogs ability to be trained and adapt to new situations. As well as greatly reducing tolerance levels, pain can alter a dog’s normal posture and movement. Even after the injury has healed the dog may still move in the posture it adopted to compensate for the original problem. He may have to learn how to move in a more effective manner once more since the muscles may have developed unevenly thus maintaining the posture the dog adopted to protect the injured area. Changes in hormones, thyroid imbalances, arthritis, hip dysplasia, and other medical problems give rise to many issues. Whilst veterinary care is paramount, awareness of how the underlying problem is affecting your dog gives you the opportunity to reduce stress and minimise the knock on effect the issue may have on your dog’s posture and behaviour. Shock as a result of an accident or an emotional upheaval such as being in kennels, bereavement, or change of circumstance can cause tension throughout the body. Just as with humans, even low levels of stress can cause physiological changes and influence the dog in his day to day existence. Lack of exercise, inappropriate environment, or unsuitable training methods can all cause stress in a dog and exacerbate habitual and instinctive behaviour. Poor nutrition and food allergies can also cause tension through the body. Some dogs present tension patterns right from birth. Puppies with higher levels of tension in their skin or in specific parts of their body will generally be more vocal and more demanding from even a few days old. Unless these tension patterns are reduced it is likely that the problems will grow as the puppy matures. Consulting a veterinary surgeon is vital if you suspect an underlying physical problem. Making suitable adjustments to the environment and management of the dog may be necessary. Despite being owned by very experienced handlers, Ruby had always been difficult to handle and train. Since early puppy hood she had always displayed a very reactive personality and would attempt to bite anyone who tried to initiate contact with her. In assessing her posture it gave her owners information as to how they could begin to reduce the reactivity. Ruby was glassy-eyed, very high headed and with a high tail set. She was so tense through her back that she gave the appearance of having her hackles slightly raised. This posture is typical in dogs that are highly defensive. By addressing her physical state through simple body TTouches and ground exercises her owners were able to bring about enough change in the space of one day that Ruby allowed and other people to work with her. Four weeks later Ruby went to the vet for a health check and for the first time in four years did not have to be muzzled for the examination. Ruby’s problem was nothing to do with the way she had been handled in her early years – she was simply born that way. The tension in her body was dictating how she had to behave. She could only operate within a very narrow window with the inflexibility in her body causing her to be inflexible in her mind thus limiting the options of self-expression available to her. Dogs use their eyes to communicate. Looking any dog directly in the eye can be unsettling for the dog and can trigger unwanted responses. If nervous and more prone to flight, the dog will look away and will avoid direct eye contact. If the dog is unable to remove itself from the situation, it may nip out of fear or start shaking. In dogs that will hold your stare, direct eye contact can trigger them to jump up or lunge forward. Breaking eye contact by looking away and keeping your eyes soft when observing or interacting with dogs will reduce their stress levels and allow them to process what you are teaching them. 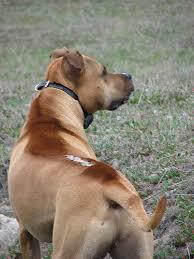 When a dog is aroused, the skin on the back tightens and the hackles rise. Some dogs carry so much tension through their body that they are habitually in this physical state of arousal. The back may be so tight that the muscles spasm on contact. This tension impairs the circulation in the skin, so the coat in this area may look dull, lifeless and scurfy. The hair may be curly, wavy or raised, and the dog may be highly reactive to contact or having the collar handled. They can be difficult to train, as they find containment difficult and react to collars, harnesses or other training equipment. Eugénie Chopin, Guild Certified TTouch Practitioner II for Companion Animals. Whose Responsibility is it to make sure that the dog you are adopting is right for your family? - many of us take more time and effort to ensure that we get the right car for our family, but how many of us really make sure that the dog we are about to come into our family is the right fit? Trigger stacking: how we set our dogs up to fail - and without even realizing it! Here are some great examples of things we do without thinking which can have major effects on our dogs. My Dog Just Won't Listen! - Sounds familiar? Find out how we so easily allow things like this to occur.